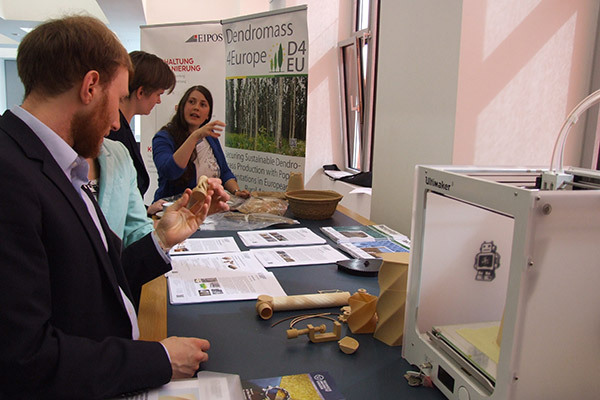 A little retrospect to our attendance at the 18th Colloquium of Wood Technology at TU Dresden in April 12-13. Dr. Christoph Leibing from IKEA Industries Malacky presented some news and recent lab results about material use of short rotation coppice for IKEA‘s functional adapted light weight boards. He explained that the harvest window of 4 to 5 months makes SRP wood a seasonal resource. But physical parameters evaluation showed great performance of poplar use in light weight boards. Compared to reference pine, density is approximately 30 % less, which allows significant savings in package weights and shipping costs. Lab scale testing has also shown that it is possible to use SRP poplar wood up to 100 % share without missing the high standards for indoor furniture application. So next steps will include tests of different material flow of SRP wood, moisture control and machinability tests of the new poplar light weight board. Besides the oral presentation D4EU also provided information at a booth, which was frequently visited. Daniela Einer from TU Dresden demonstrated new bio-based materials and showed some examples of the innovative use of biocomposites. For example, 3D-printing enables almost unlimited possible uses. Currently, tips for small research rockets or gear wheels are printed from biocomposites. Previous Post Previous Post: Meet D4EU at the 23rd Conference on Renewable Resources – Bioeconomy 3.0. Next Post Next Post: Kia ora D4EU!